Winter came early and I didn't get all my tulips planted. Can I plant them in the spring? I highly recommend that you plant them as soon as possible and if you're lucky enough to get a winter day when ground temperatures are above freezing. Plant them in pots if that is not feasible. Spring will be too late if you live in the Northern Hemisphere. 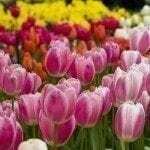 Tulips need to time (about eight weeks or more after planting) to establish a good root system before they send up leaves and flowers. Carrying tulip bulbs over until next fall is not a good idea.